For the next 90 days, these students cannot travel to the U.S. to visit family or to attend academic conferences, communications officer Dana Kenny told CBC's Mainstreet. 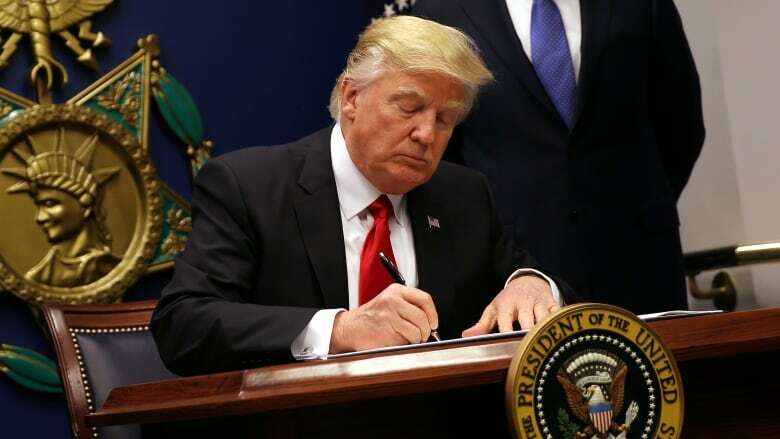 U.S. President Donald Trump's executive order on immigration affects about 30 international students at the University of Prince Edward Island, according to a spokesperson for the school. For the next 90 days, these students cannot travel to the U.S. to visit family or to attend academic conferences, communications officer Dana Kenny told Mainstreet: PEI. Trump signed the executive order last Friday, rendering the U.S. temporarily off limits to people from seven predominantly Muslim countries. Kenny said the university isn't aware of any students who are in a situation where they can't return to their homes in the U.S.
Having spoken to "all sorts" of students from P.E.I., the affected countries and elsewhere, Kenny said the reactions have been varied. "To be honest, I think the overall general consensus is simply sadness that this is taking place," he said. The university is offering support on a case-by-case basis to students, staff, faculty and alumni. "We're coming together and we're saying, 'If you do need to talk to someone or if this is preventing you from pursuing something, speak with these people,'" Kenny said. This is primarily emotional support but could also include help with travel. If, for example, the ban was preventing a student from attending a conference, the university could help to arrange a teleconference, Kenny said. The university is taking this issue "quite seriously." "We're standing in solidarity with universities across Canada that we are quite dismayed and we denounce this executive order," he said. "Essentially, we are an institution that believes in the freedom of discourse and, therefore, we look at this as putting up walls and barriers. "For us at UPEI, our barriers are ever-expanding to encompass that community to have as much diversity as possible and for discussion to go forward so that we are able to, of course, improve society on a whole."